Now stand a chance to win 5000 Rs and more by simply entering answers of Amazon World Book Day Quiz. There will be a total of 5 questions and 12 winners. The contest will commence from 23 April 2018 to 23 May 2018. 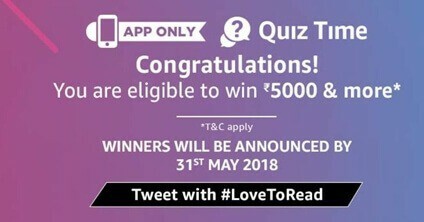 You just need to enter Amazon World Book day quiz answers same as we have written below and if you are a lucky one, you will win Amazon pay balance worth 5000 Rs and a kindle. This quiz is same as other Amazon contests and winners will be chosen by lucky draw. If you have something to share with Amazon and other people, you can tweet with #LoveToRead. What did the monk in Robin Sharma’s book sell? In the book ‘The Chamber of Secrets’ who is James Potter’s son? Which of these is the title of the first book in Amish’s Shiva trilogy? Winners of World Book day quiz on Amazon will be announced on 31st May 2018. The draw of lots will be carried out during the Contest Period for the questions and a total of 12 (Twelve) participants will be selected as winners by a random draw of lots. A total of 12 (Twelve) participants will be selected as winners of the Contest. The first 6 declared winner(s) will be eligible for winning Rs.5000 and a Kindle and Next 6 winners will get Rs.5000.